This morning I thought I would look and see what’s the latest nutrition and advice. 8 HEALTHY EATING TIPS FOR KIDS-health eating for 1-3year olds. Their first point is “Base your meals on starchy foods: bread, potatoes, pasta, rice, noodles” and point two is “ Eat lots of fruit and veg”. like The Tree Of Life this information is twisted around the wrong way. Point one should stress fruit and veg and base your meal around fruit and veg. Cereal are cheap fillers, comfort foods, used to make meal of meat go further in terms of filling tummies. However I would say to all young mums, if I could live my life over again I would definitely introduce veggie based meals to my children instead of pasta and rice. If you are going down the fill them up with quick cheap starchy carbs then please please please stick to whole meal. If your children are difficult then mix wholemeal pasta or rice with loads of veggie sauces. According to Dr Liala Afrika, white rice, and flour are stripped of essential mineral and vitamins that help good mental health. Too many behavior problems in children are linked to the lack of these mineral from diets that are high in refines starchy white carbohydrate. We always need to remember these products ;whit rice and white flour are commodities on the stock exchange and will be promoted through the media at an opportunity. Please note in the last 2-3 years, the rise in baking programmmes that hardly ever tell you to use whole meal flour or rice. “The health benefits of wheat depend entirely on the form in which you eat it. These benefits will be few if you select wheat that has been processed into 60% extraction, bleached white flour. 60% extraction—the standard for most wheat products in the United States, including breads, noodles and pastas, baked goods like rolls or biscuits, and cookies—means that 40% of the original wheat grain was removed, and only 60% is left. 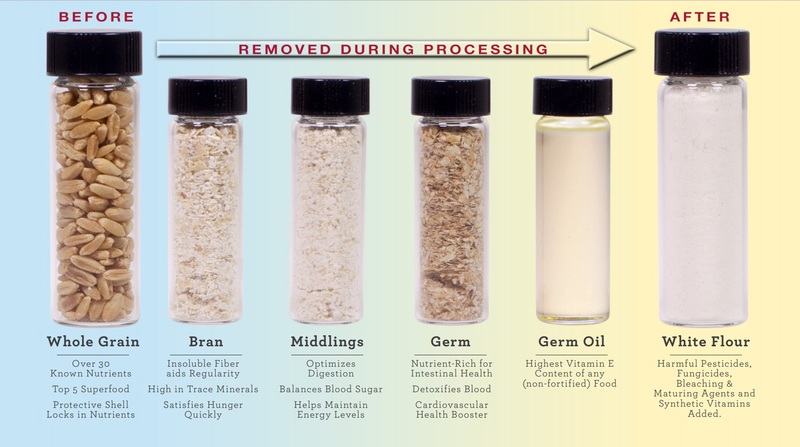 Unfortunately, the 40% that gets removed includes the bran and the germ of the wheat grain—its most nutrient-rich parts. In the process of making 60% extraction flour, over half of the vitamin B1, B2, B3, E, folic acid, calcium, phosphorus, zinc, copper, iron, and fiber are lost. Since 1941, laws in the United States have required “enrichment” of processed wheat flour with vitamins B1, B2, B3 and iron in response to the problems created by 60% extraction. Since not nearly as much of these B vitamins and iron are replaced as are removed from 60% extraction flour, “enriched” seems an odd word to describe this process. If you select 100% whole wheat products, however, the bran and the germ of the wheat will remain in your meals, and the health benefits will be impressive! Our food ranking qualified whole wheat (in its original non-enriched form) as a very good source of dietary fiber and manganese, and as a good source of magnesium.